Accommodation of the Year 2014 - Popularity Prize I. Enjoy the ambience and service of a luxury hotel – experience the unique hospitality of the Elizabeth Hotel! Ideally located right by the Gyula Castle and only a stone’s throw from the renowned Várfürdő SPA the hotel is an oasis for both business and leisure travellers. The Elizabeth Hotel, the only four stars rated hotel of Gyula awaits its visitors with 48 luxurious rooms and the Elizabeth Suite. Originally built in 1905 as a private mansion of the Almásy-family another wing was attached to the building in 1934. This wing functioned as the Erzsébet Orphanage, which according to unwritten tradition was named after Queen Elizabeth, a regular guest of the Almásy-family. The hotel pays tribute to her loving memory. For culinary delights our guests are welcome in the Restaurant Almásy and the hotel bar, both adjoined by terraces offering magnificent views of the Gyula Castle. In our fairy-tale wellness centre guests shall find the ideal way relax and rejuvenate in the end of the day. Cultural enthusiasts are invited to the unique hotel gallery, supporting contemporary Hungarian arts. 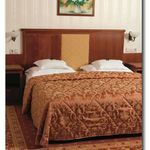 The rating of Elizabeth Hotel Gyula is 9.5 from the maximum 10, 995 based on actual and valid guest ratings and reviews. Based on the reviews and comments of actual guests, the services of the Elizabeth Hotel Gyula have received a high rating of 9.3/10.